Cables can be a confusing topic capable of confounding even the most technically inclined minds. As the world’s communications infrastructure grows, the corresponding demand for interconnect products such as cables, connectors and modules will expand exponentially. With such an immense variety of cables to choose from and conflicting advice as to what combination of cables are needed for a particular application, wouldn’t it be nice to have an authoritative source to rely upon that can answer your questions? Well now there is! The Cables on Demand Product Manager, a.k.a. “The Cable Guy”, will answer your questions and offer advice in an easy-to-follow blog format here at http://www.CablesOnDemandBlog.com. Cables on Demand (http://www.CablesOnDemand.com) is a division of Amphenol Corporation, the second largest manufacturer of cable and connector products in the world. With over 3,000 products available for same-day shipment in their New York warehouse, Amphenol Cables on Demand can provide the perfect cable for your project at factory-direct prices. 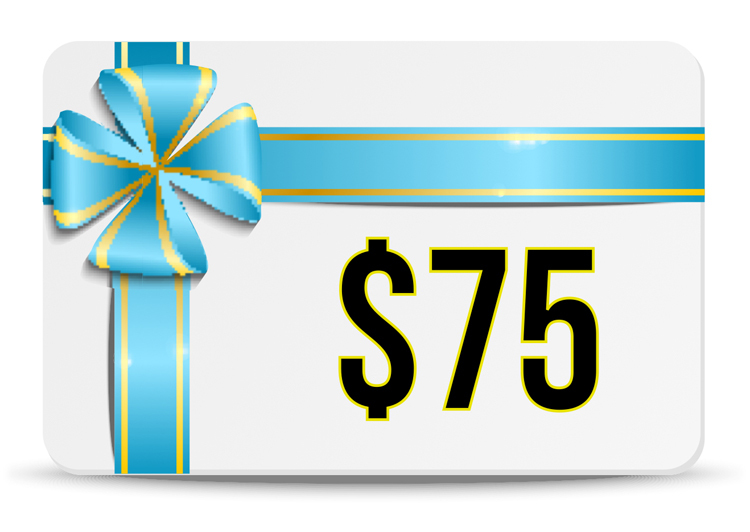 Call today @ 1-866-223-2860 or contact customerservice@cablesondemand.com. This entry was posted in Cables on Demand on December 16, 2013 by cablesondemand. The global proliferation of Wi-Fi devices over the past decade has proven to be nothing short of astounding in its massive scope. Amazingly, enough Wi-Fi capable devices are being brought into the marketplace to provide every single person on the planet with one new Wi-Fi device per year. 24 billion Wi-Fi devices are projected to be online globally by the end of the decade. Sounds great, right? Well, in theory, it is a wonderful thing, but the trend of connecting everything to a Wi-Fi network comes at a substantial price. Although there are technically two primary Wi-Fi bands from which to operate, including the 2.4 GHz band and the 5 GHz band, well over 9 out of every 10 Wi-Fi networks today operates in the crowded 2.4 GHz band. The 2.4 GHz Wi-Fi band enjoys greater popularity because the technology behind it is simpler and cheaper — and therefore better suited to mass production and adaptation by the marketplace. When you can squeeze full 2.4 GHz band Wi-Fi functionality onto a circuit board the size of a coin, anything and everything will soon be designated as a “Smart” device vying for their own limited slice of the Wi-Fi airwaves. Whether your “Smart” refrigerator is sending off a wireless signal that you are low on milk, or your “Smart” sprinkler system is going online to check the weather forecast, it all competes for space. When that space is occupied, it ultimately leads to a degradation of network connection quality and throughput (speed). Perhaps the best way to understand the strengths and liabilities of each of the Wi-Fi bands is to look back to a much older technology: Radio Broadcasting. The oldest broadcast band, the AM band, can work great during the daytime with low-bandwidth content such as Talk Radio or News. Once you attempt to broadcast high bandwidth content such as music, the quality limitations of the technology become blaringly obvious. The sound of music on AM is hollow — it lacks definition with its flat bass response and practically no high frequency (treble) characteristics, thereby making music lifeless. It only gets worse from there. Try tuning in a weak AM station during the evening and you will often be presented with a complete mess on your hands. On one station frequency, or channel, you may hear 10 different radio stations overlapping each other at the same time. The station you want to listen to, which may only be 25 miles away, may get completely trounced upon by an AM station located 2,000 miles across the country! Needless to say, the listening experience on AM is nearly ruined by its technological limitations. The 2.4 GHz Wi-Fi band can easily be considered the “AM” band of Wi-Fi. If your home or business occupies a fairly population-dense area, whether it may be an apartment complex or a business district high-rise, it is not inconceivable for there to be dozens if not hundreds of competing Wi-Fi networks sharing the 2.4 GHz band. With only 11 channels to choose from in the 2.4 GHz band, your Wi-Fi network will undoubtedly be forced to share one of those 11 channels with several other networks. Like AM broadcasting during the daytime, sometimes your network can peacefully co-exist on the exact same channel as another network. Your equipment’s error-correction capabilities will do its best to strip away the competing network traffic and make your network’s signal the dominant one. However, error correction can only go so far. If a 2.4 GHz Wi-Fi channel is too saturated by the competition, it suddenly resembles AM broadcasting during the night. Your network traffic may break through in certain areas, but even if it does, the connection speed and quality will suffer. When the specifications for the 2.4 GHz Wi-Fi band were initially laid out, it was based on the idea that the signal would only require a small amount of bandwidth. The original standard operated at only 2 Megabits per second (2 Mbps). It was soon upgraded to the 802.11b standard at 11 Megabits per second. At this speed, the signal would be able to take up just one channel-wide space and not interfere with an adjacent channel, i.e. part of your signal on channel 1 spills over into channel 2, making reception on channel 2 worse for another network operating on that channel in the vicinity. The rapid evolution of the internet in recent years has drastically raised the requirement for bandwidth — especially with high-definition digital video content which could easily max out an 11 Mbps Wi-Fi channel. If more than one video stream is being sent at the same time, the system won’t have the capacity to handle it. This lead next to the 802.11g standard on the 2.4 GHz Wi-Fi band, raising the throughput (speed) to 54 Mbps. When it too was insufficient, 802.11n came to market with speeds up to 600 Mbps — a HUGE increase. The problem now is, you cannot squeeze 600 Mbps of data throughput into a single narrow channel — it just isn’t possible. To make it work, the Wi-Fi router has to use multiple antennas and spread the signal out amongst multiple channels. If you were operating a Wi-Fi network on an isolated country farm, this might be doable, but if you are like most people, you will operate the network in a more population-dense urban or suburban area. A single tenant could operate a higher powered 802.11n 2.4 GHz Wi-Fi router/access point on a middle floor using channel 6 and potentially broadcast over 82% of the entire 11 channel 2.4 GHz band throughout an entire building! Imagine if multiple tenants try and do the same configuration with their networks — the resulting mess will be hard to filter through for any other active Wi-Fi devices within the immediate area. Now for the good news — The Cable Guy is here to help! Over the course of several new articles in this series, I will discuss several practical “real-world” tips, tricks and strategies to ensure your Wi-Fi network is dominating the air space in which you want it to operate. I will help guide you through both the software and the hardware side of the issue, since they are both important factors to consider. Primarily, I want to focus on strategies that cost absolutely nothing to implement, other than a little time and patience of course! If you are like many Wi-Fi network users in crowded areas of the country — your patience has no doubt been worn down already. Don’t despair, these simple and effective strategies should help dramatically. 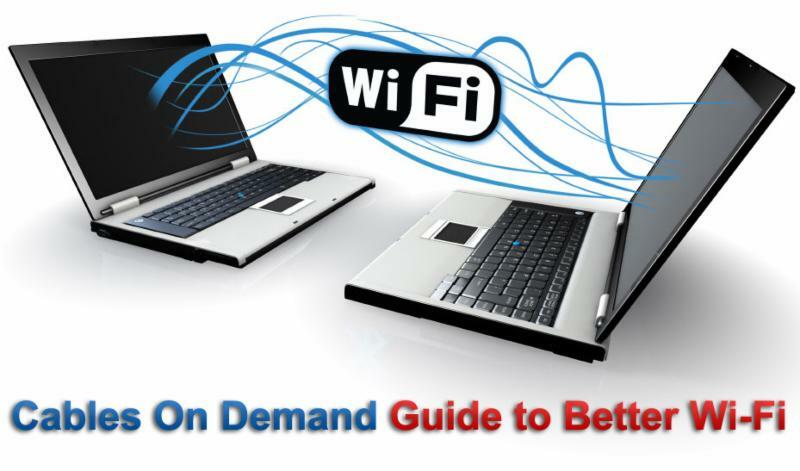 Stay Tuned for the next article of this series in which I will discuss several “tools of the trade” used for Wi-Fi optimization and guide you through their effective usage in making your Wi-Fi experience a better one. This entry was posted in 2.4 Ghz band, 5 GHz band, 802.11, 802.11ac, 802.11b, 802.11g, 802.11n, Uncategorized, Wi-Fi and tagged 2.4 GHz, 5 GHz, 802.11, 802.11b, 802.11g, 802.11n, Wi-Fi, WiFi, WiFi antenna, WiFi band, WiFi router on February 26, 2015 by cablesondemand. New Post: Active or Passive SFP+ Cables? I am a small business owner in a technology-heavy industry that is relying more and more on cloud-based application, storage and management systems; for both internal use as well as remote access by end-users, i.e. clients, subscribers and affiliates. I am quickly realizing that our company runs the risk of being left behind our more tech-savvy competitors. Needless to say — I cannot let this happen. Bottom Line: Our present network infrastructure has absolutely no headroom left from which we can grow. It is basically nothing more than a 1000BASE-T network with some ancient 1-Gig Mini-GBICs (SFP’s) on the back-end. I really need to scale this up by a factor of ten just to be on par with the competition and would like further scalability options in the near future without having to upgrade all of the hardware. I think I have found the solution I’m looking for by using 10-Gigabit Ethernet SFP+ equipped switches with the possible aggregation of those switches via 40-Gigabit Ethernet QSFP+ at the top of the racks. Here’s my dilemma — I’ve found several switches that are relative bargains from a price perspective, but their datasheets specifically call out the use of Active SFP+ Direct Attach Copper Cables. They will NOT work with Passive SFP+ Direct Attach Copper Cables. Why can’t I use your passive SFP+ cables with their switches? Why do the active SFP+ cables cost so much more than passive? Your help is sincerely appreciated! Thanks Bill for your excellent questions. I know you are certainly not the first customer to express interest in network upgrades using SFP+ as the cornerstone of the new network. You have chosen the absolute best option for affordability, scalability and reliable performance, which incidentally sounds precisely what your business environment demands at this time. Good work! Now let’s get down to the nitty-gritty, shall we? First, we need to establish exactly what Passive Cables are and what role they play. A Passive Copper Cable, such as the 10-Gigabit Ethernet SFP+ Direct Attach Copper Cable product you are interested in, is effectively viewed as a transparent cable to the switch and requires little to no direct power to operate. A passive cable therefore passes the signal through it without any modification or processing such as amplification or equalization. Signal conversion occurs first in instances where electrical circuits must interface with optical circuits. Since some switches operate select ports in the optical domain (i.e. fiber optic light pulses), that optical signal must then be converted over to an electrical signal that can be further modified and reliably sent over an electrical transmission medium such as copper cabling. Signal conditioning is in essence preparing the signal for the next step of the process. This could involve formatting the signal using a standardized electrical modulation pattern that other down-stream equipment can recognize. This could be conditioning the signal into a 10-bit/8-bit pattern where 8-bit segments of data require encapsulation in a 10-bit “packet” featuring additional header information that is used for error correction and re-transmission mechanisms. The next critical step, signal amplification, will raise the newly conditioned signal from a low-strength “machine level” signal to a far more powerful or amplified signal. Signals are kept at lower strength levels inside the switch’s processing architecture for several reasons, including reduced power consumption, improved heat dissipation, reduced noise/interference characteristics and so on. However, this internal “baseband” signal is far too weak to travel the typical distances commanded by cable assemblies. They’re only designed to travel a few inches around a PC-board or chipset! Now, if we were dealing purely with signals of past eras such as 10/100 Megabit (Fast) Ethernet, the final phase known as signal equalization would be totally unnecessary. However, a signal such as the one sent over SFP+ Cables requires hundreds of MegaHertz (MHz) or even GigaHertz (GHz) of signal bandwidth to operate effectively. The problem with such wide-banded signals is that the lower portion of the signal may arrive at the other end of the cable faster or stronger than the higher portion of the signal. This causes an anomaly known as time delay and/or phase delay SKEW that absolutely wreaks havoc on the signal itself, sometimes to the point of being unrecoverable. To avoid this, the signal must be equalized accordingly. On the transmission channel of the link, the signal must go through a process called Pre-Emphasis. It does exactly what it sounds like — it pre-emphasizes (boosts) the portion of the signal that tends to get skewed. Similarly, on the receive channel of the link, the signal portion must be reciprocally de-emphasized (lowered). This complete process of equalization equalizes the signal so that it is uniform and free of SKEW and therefore ready to be sent over a specific transmission medium, i.e. a SFP+ Direct Attach Copper Cable. So, What are the Implications of Everything Above? Approximately 7 out of every 8 SFP+ enabled switches on the market today perform all of the aforementioned signal processing/conditioning functions internally and automatically. Because of this, customers who own these switches are free to use a wide selection of SFP+ Passive Direct Attach Copper Cables in lengths ranging from 0.5m all the way up to 10m (33 feet). As you are already aware, these Passive SFP+ Cables are extremely affordable (prices start around $30.00). The cables have only basic circuitry inside their integrated SFP+ connectors which tell the switch what brand and length they are — nothing more. However, the switch manufacturers realized that some business owners, such as yourself, may prefer the option of lower up-front costs on the switches since they may not be populating all of the switch’s SFP+ ports with cables for some time. 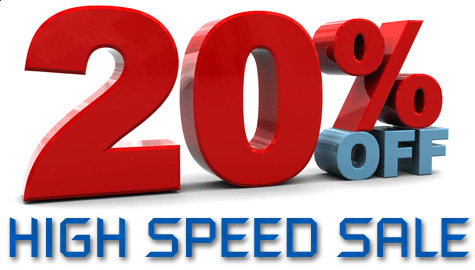 The market has seen 1 out of every 8 of its SFP+ switches configured in this lower-cost arrangement. In essence, all of these value SFP+ switches feature “dumb” SFP+ ports on them with little to no signal processing capabilities built in. True, this may bring the upfront costs down because the signal processing chipsets in these ports are both complex and costly to integrate. However, there is no such thing as a free lunch as they say. If indeed we take all of that signal processing circuitry out of the switch, it has to be made up for somewhere else. Well, where else exactly can that signal processing circuitry go? There’s only ONE possible location available — THE CABLE. Switches with so-called “dumb” SFP+ ports therefore need “smart” SFP+ Cables to pick up the processing slack. A passive SFP+ cable can be made “smart” by integrating signal processing circuitry into its built-in connectors and actively powering those circuits with DC power provided by the switch — Hence the name: ACTIVE SFP+ CABLES. Since Active SFP+ Direct Attach Copper Cables require active smart circuitry in them to work, the cost of that circuitry, usually installed in the switch instead, transfers over to the cost of the cable. This is precisely why Active SFP+ Cables cost up to 3x their passive counterparts. If customers are in the same situation as Bill, I highly recommend performing a comprehensive cost analysis of two network development options along with appropriate deployment timelines. For instance, let’s say you plan on buying 2 24-port SFP+ switches but only need to outfit 12 of the 24 ports in year one. As you can see, in year one, both the Active SFP+ Cable Option and the Passive SFP+ Cable Option feature the same cost of $4,960. However, the cost of the switch is a fixed cost and the cost of the cable is a variable cost. Let’s say you wanted to outfit the remaining 12 open SFP+ ports with cables in year 2. For the more expensive upfront cost switches that support Passive SFP+ Cables, those 12 cables can be purchased for an additional $960. However, for the cheaper upfront cost switches that only support Active SFP+ Cables, those 12 cables can be purchased for an additional $2,160. So is it worth saving $1,200 on the switches in year one, only to have to spend double that amount more on cables by year two? Probably not. However, if you will likely not have to populate those extra ports ever in the future (i.e. wait for the next generation of switch technology altogether), maybe it’s worth it. However, these instances are atypical and therefore it is the opinion of this Cable Guy that it is always preferable to pay more upfront for the switch and benefit from drastically cheaper cables! As always, I recommend Amphenol Cables on Demand (www.CablesOnDemand.com) for all of your 10-GbE SFP+ Cable needs. Amphenol is one of only three companies in the world that actually manufactures all components of an SFP+ Cable including the raw copper wire and the SFP+ connectors (active and passive versions). Other companies merely assemble some unspecified combination of SFP+ subcomponents, some of which may be of questionable quality and/or qualification. When you want your network to work for you 100% of the time, you NEED the best quality network cabling and Amphenol is the global leader in quality network cabling products — period. You can buy these cables factory-direct from Amphenol Cables on Demand at the best possible price — all with no lead-time and same-day shipping when ordered before 3PM Eastern! This entry was posted in Uncategorized on September 9, 2014 by cablesondemand. Question: What’s the difference between a regular SMA Connector and a Reverse Polarity SMA Connector? In the late 1990’s, at the dawn of the WiFi technology boom that has inevitably changed the way we communicate, the Federal Communications Commission was greatly concerned. Soon, wireless routers and access points would be entering the market and blasting the airwaves with short-distance transmissions that had never previously entered our airspace. While these devices were designed to have a limited range, generally enough to cover a typical residence or office, the FCC knew that it was only a matter of time before users would attempt to boost the device’s range with amplifiers and/or external antennas, which could potentially wreak havoc on the WiFi band. The FCC’s solution was a stop-gap measure known as Reverse Polarity Connectors. For decades, SMA and TNC connectors have been used successfully for high-frequency applications, such as cell-phone networks. The problem was that SMA’s and TNC’s were readily available on the market in the form of coaxial cable assemblies and antennas. To prevent users from equipping their wireless routers with such accessories, the FCC mandated the WiFi manufacturers utilize a new type of connector on the back of their devices — The Reverse Polarity Connector. For a couple of years, this strategy worked, but eventually Reverse Polarity versions of SMA and TNC connectors, known as RP-SMA and RP-TNC respectively, became just as readily available as their regular counterparts. So how do you tell which one is which? A second look at the image above will help you. An SMA Male Connector is shown on the left. Notice that there is a pin sticking out of the center of the connector. A Reverse Polarity SMA (RP-SMA) Connector is displayed on the right. Notice that instead of a center pin, there is a center socket. It is the swapping out of a center pin for a center socket that makes the connector a Reverse Polarity SMA (RP-SMA). Note that both of the above connectors are considered male connectors. Male SMA and Male RP-SMA connectors both feature their threads on the inside of the connector shell, i.e. they twist onto a female SMA or RP-SMA connector that feature their threads on the outside of the shell. Stay tuned for the official launch of our new RP-SMA and RP-TNC Coaxial Cable Assemblies in the weeks ahead at: http://www.CablesOnDemand.com. This entry was posted in Coaxial Cables, Reverse Polarity SMA, RF Assemblies, SMA Connector, Uncategorized and tagged reverse polarity, router connector, rp-sma, rp-tnc, sma, tnc, WiFi, WiFi antenna on May 5, 2014 by cablesondemand. Cables on Demand (http://www.CablesOnDemand.com), a division of Amphenol Corporation (NYSE:APH) and a leading online retailer of high-performance cables, connectors and accessories, has formally launched an official companion blog website at http://CablesOnDemandBlog.com. The technical-themed blog site aims to answer many of the most prevalent product-centric questions posed by the organization’s sizeable customer base in the U.S. and abroad. Our goal with CablesOnDemandBlog.com is to empower individuals with knowledge; knowledge they can use to make an educated decision about their specific cabling needs. 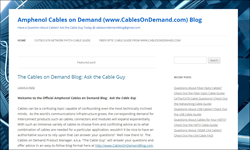 Amphenol Cables on Demand (http://www.CablesOnDemand.com), an e-commerce subsidiary of one of the world’s largest cable and connector manufacturers, Amphenol, is excited to unveil a new dedicated blog website athttp://CablesOnDemandBlog.com. 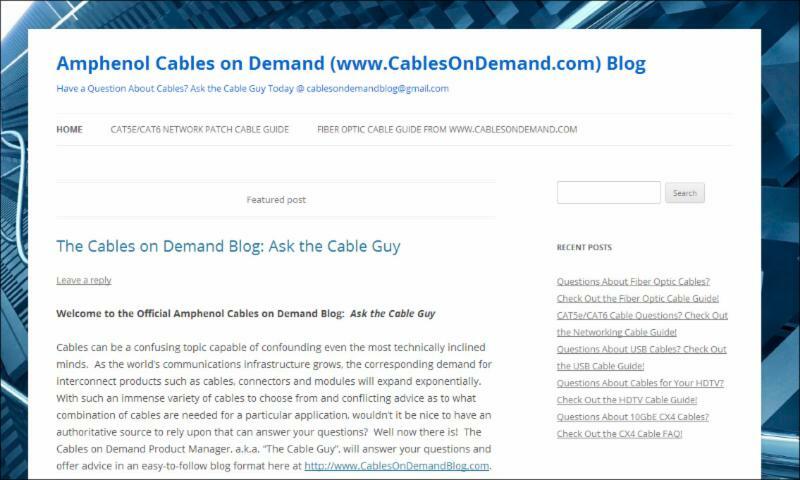 The recently launched blog site follows a question and answer format, entitled “Ask the Cable Guy”, in which both customers and the public-at-large are welcomed to submit their respective questions regarding most any technical aspect of cable and connector products. Select questions will then be answered publicly on the blog website by “The Cable Guy”, a cabling technology aficionado with decades of relevant industry knowledge. 10-Gigabit Ethernet Backbone Interface Options: Which One Should I Choose? What’s the Difference Between 50-Ohm and 75-Ohm Coaxial Cable? How Do I Know How Many Amps Your Cables will Handle? Amphenol Corporation (NYSE:APH) is one of the industry’s largest manufacturers of connectors and cables worldwide, comprised of over fifty industry-leading divisions including Times Fiber Communications, Times Microwave Systems, Teradyne Connection Systems, Amphenol Interconnect Products and Amphenol RF. Since 1934, Amphenol Engineers have designed innovative interconnect solutions such as the BNC and UHF connector series, SKEWCLEAR wire technology, and XCede backplane architecture. Amphenol Cables on Demand, launched in 2006, is Amphenol’s first wholly owned subsidiary optimized for the distribution of Amphenol brand cable products online. Based in Endicott, NY, Cables on Demand offers same day shipping before 3:00PM Eastern on over 3,000 unique cable SKUs. The company’s high product mix supports a vast array of applications including Network, Broadcast, Test, Instrumentation, Audio/Video, Data Storage, Clustered Computers, Prototyping, Automation, Industrial Control, Wi-Fi, Automotive and Avionics. This entry was posted in Uncategorized on May 5, 2014 by cablesondemand. We plan to upgrade our network backbone to 10-Gigabit Ethernet. What interconnect platform should we use? Thanks Chris for your question. This topic comes up quite frequently for a number of reasons. Not too long ago, only medium to large enterprises could viably afford to make the leap to 10-Gigabit Ethernet on their networks. That is simply no longer the case today. Not only are there hundreds of 10GbE-ready switch manufacturers on the market today, but there are also multiple interconnect platforms available that support the 10-Gigabit Ethernet protocol. As you can see by the timeline above, 10-Gigabit Ethernet has already surpassed the point of being a widespread and mature technology; ensuring low implementation costs. Because this is a lengthy topic, I will need to divide it up into two segments. The first segment will focus on the most obvious interconnect platform for 10-Gigabit Ethernet applications: 10GBASE-T. 10GBASE-T, also referred to as IEEE 802.3an-2006, is essentially 10-Gigabit Ethernet over standard twisted pair (UTP or STP) copper wire, such as Category-6 (CAT6) Cables and Category-6a (CAT6a) Cables. A great number of networks have featured a 1000BASE-T (Gigabit) backbone using CAT6/CAT6a. Transmitting data at 1.0 Gbps speeds over this cable type is fairly easy from a hardware perspective and was therefore a highly implemented option for network administrators. Bandwidth: To transfer data at 10-Gigabit speeds, the required cabling must be designed to support a substantial amount of bandwidth. To operate effectively over a sizable distance (up to 100 meters or 330 feet), Category-6a Cabling must be used thanks to its inherent support of up to 500 MHz of bandwidth. To compare, regular Gigabit Ethernet (1000BASE-T) can operate with plenty of headroom using a 100 MHz bandwidth capable Category-5e (CAT5e) Patch Cable. To increase bandwidth, you have to operate at extremely high frequencies. High frequencies behave quite differently from lower frequencies, thus demanding a more capable interconnect design. Bandwidth can be visualized as a pipe (see below). A high-bandwidth capable interface, like 10-GbE, requires a thicker data pipeline (backbone) so that all of the high-speed data can stream through it without resistance. If you try and force high-bandwidth data through a low-bandwidth pipe, you will witness a massive slowdown in data throughput. Sometimes, like in real life, the pipe will burst and the interface will shut down. 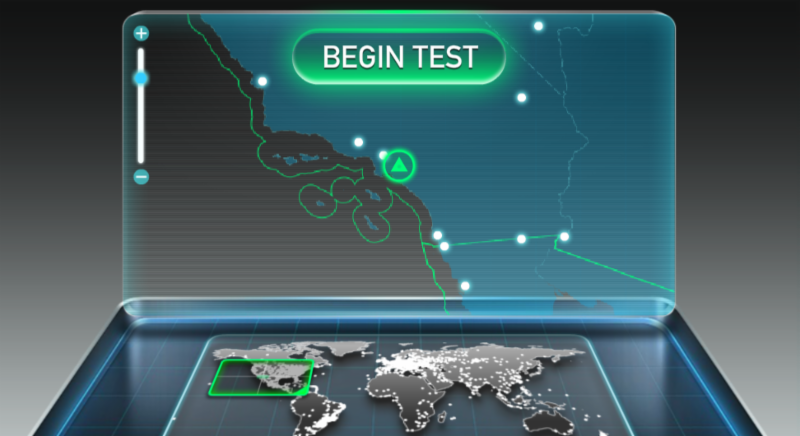 This is why maintaining high bandwidth is so critical. Alien Crosstalk: Alien Crosstalk, also known as ANEXT, is when signals from outside sources, such as other patch cables in close proximity or other localized sources of electromagnetic interference (EMI/RFI) like lighting, power transformers, wireless access points, etc., interfere with the 10-Gigabit Ethernet signal that travels down the cable. Regular Category-6 (CAT6) Cables do not address the issue of ANEXT directly and as a consequence can only support 10-Gigabit Ethernet at distances up to 50 meters (166 feet). To mitigate the problems associated with bandwidth and ANEXT, Category-6a Cables utilize three principles: Pair Separation, Shielding and Tight Tolerance. Pair separation involves placing a plastic x-shaped insulator in the middle of the cable itself. This keeps a designated amount of spacing between the wire pairs, thus assisting with Near-End Cross-Talk (NEXT) and maintaining proper cable impedance. Shielding involves shrouding the entire cable in a concentric ring of Aluminum foil. This prevents outside EMI/RFI interference and related Alien Cross-Talk (ANEXT) from wrecking the signal. Tight tolerance simply means that Category-6a (CAT6a) Cabling is designed and assembled with minimal tolerance for out-of-specification characteristics such as maintaining a perfect number of cable twists-per-inch. Now that the technical specifics are out of the way, how do we reach a determination as to whether 10GBASE-T (10-Gigabit Ethernet over Twisted Pair) is the right choice for your network upgrade? 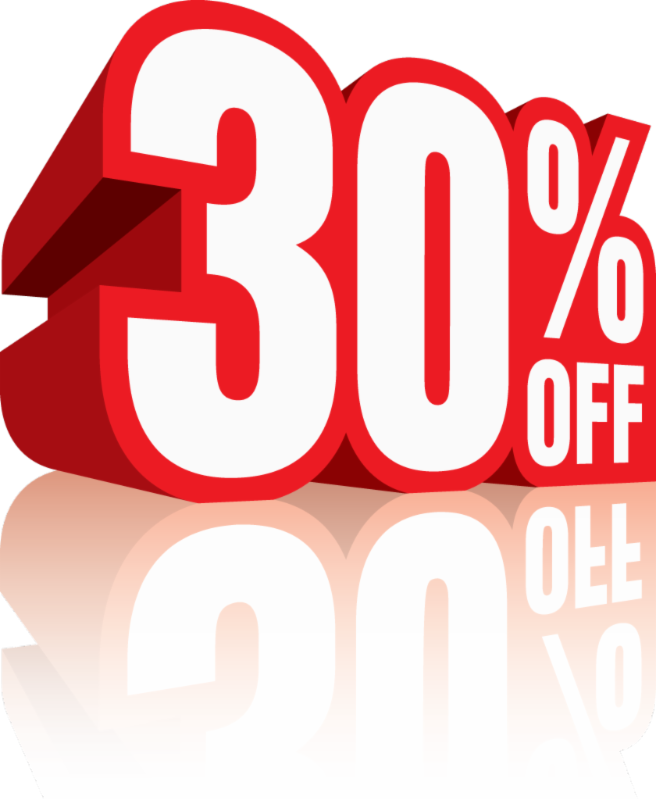 I like to look at three critical cost factors. The more dollar signs shown, the more expensive the cost. In all likelihood, your largest upgrade expense is going to come from the cost of updating all of your switches to 10-Gigabit Ethernet compliant models. Unfortunately, this is where 10GBASE-T fairs the absolute worst. Development was significantly delayed on 10GBASE-T hardware, specifically the silicon chipsets that power the switches. 10GBASE-T proved far easier to develop on paper than it did in the real world. As a consequence, while 10GBASE-T products are just barely trickling out to the market from a select few manufacturers, other 10-Gigabit Ethernet interface standards, such as SFP+ Direct Attach and 10GBASE-CX4 have taken hold. This is where the 10GBASE-T interface dominates hands-down. Cables for 10GBASE-T are the absolute cheapest option because all you need to purchase are Category-6a (CAT6a) Patch Cables. At Amphenol Cables on Demand (http://www.CablesOnDemand.com), we stock a variety of Category-6a (CAT6a) Patch Cords in your choice of length and color at prices starting at only $3.16 (even less when on sale). 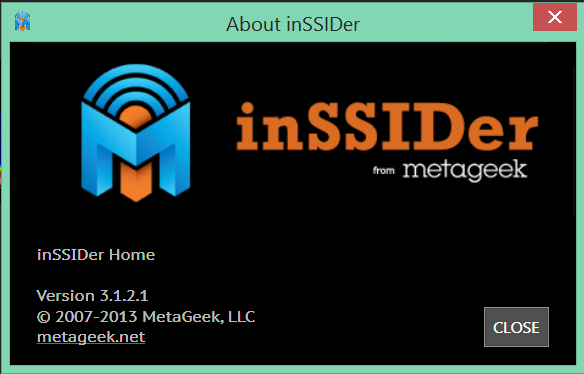 This is perhaps 90-95% cheaper than the other aforementioned interface options! Power Consumption is the Achilles Heel of 10GBASE-T. The fact is, the engineers who came up with the Ethernet standard decades ago never imagined that inexpensive twisted pair communications cable would support the blazing fast speeds of today. As such, engineers have had to squeeze 10-pounds of bandwidth into a 1-pound bandwidth bag. This comes at a price. To make up for the cable’s inherent deficiencies, the switch has to do the heavy lifting by using extra power to sort through all of the signal errors and lost packets that will naturally occur over twisted pair cabling. As such, 10GBASE-T switches are both power hungry and heavy in terms of heat dissipation, posing a major issue from an environmental management perspective. There’s no such thing as a “Free Lunch” as they say; in this case the free lunch being cables that cost 90-95% less than other options! While 10GBASE-T, 10-Gigabit Ethernet over Twisted Pair, has been hyped for years as the inevitable de-facto solution for 10-Gigabit networks, reality simply eliminates this possibility. Delayed development, cost overruns, limited suppliers; combined with high switch and power consumption costs makes 10GBASE-T an unattractive option. The only upside to 10-Gigabit Ethernet over CAT6/6a is the fact that CAT6/6a Cables are so inexpensive. I can’t in good conscience recommend 10GBASE-T for your network upgrade under these circumstances. Stay tuned for the follow-up blog to this question in which we will discuss two other 10-Gigabit Ethernet interface choices: CX4 and SFP+. This entry was posted in 10 Gigabit Ethernet, 10GbE CX4 Cables, Cables on Demand, CAT5e & CAT6 Cables, SFP+ Cables and tagged 10-Gigabit Ethernet, CAT5e, CAT6, CAT6 Cables, CAT6a, CAT6a Cables, Category-6, Category-6a, CX4, SFP+ on April 1, 2014 by cablesondemand. What’s the Difference Between 50 Ohm and 75 Ohm Coaxial Cable? What is the difference between 50 Ohm and 75 Ohm Coax? First, we need to define what an Ohm is and what exactly it measures. An Ohm is a unit of resistance — that is the resistance to the flow of electrical current through a circuit. In the most basic applications, where we are dealing with DC or Direct Current electricity, such as that from a typical 12-volt car battery, we are measuring the resistance in Ohms. However, the second we try and send AC or Alternating Current through a circuit, we are no longer measuring resistance, we are measuring impedance. Alternating Current (AC) is more complex because it is not merely the magnitude (relative strength) of the signal that is being assessed, but the phase of the signal as well. An AC signal (waveform) is constantly switching its phase between negative and positive a certain number of times per second. For regular 120-volt house electricity, it changes phase 60 times per second. This is often abbreviated as 60 Hz. The complex relationship between this magnitude and phase means that an AC circuit’s impedance consists of 3 essential components that are resisting the flow of the alternating electrical current. The first is resistance, which we just mentioned. The second two components are comprised of the circuit’s inductance and capacitance. Inductance essentially measures voltage(s) that are induced (created) in the circuit from the electrical current’s magnetic field. Capacitance effectively measures the electric charge that is stored in the circuit from the presence of these voltage(s). The combination of the circuit’s inductance and capacitance together is called reactance. It’s not just household power that operates using AC — practically everything in our tech-driven society uses Alternating Current in the form of Radio Frequency (RF) energy. Your favorite AM radio station operates at a frequency of around 1 MegaHertz (MHz) or 1-million cycles per second. Your cell phone may operate at 900 MHz or 900-million cycles per second. To properly transmit these high-frequency RF signals, you have to have a medium of some sort that can deal with the complex interaction of resistance, inductance and capacitance. In most cases, we utilize coaxial cable. Coaxial cable is comprised of three main components. In the middle of the coaxial cable is what is known as the center conductor. It can be made of either solid or stranded wire and is typically a mix of Aluminum and Copper. Surrounding the center conductor is something called the dielectric. The dielectric acts as a buffer of sorts to keep the center conductor isolated and straight. It usually is comprised of some blend of plastic and/or foam. Finally, on the outside of the dielectric is the coaxial cable’s shield, which is usually a combination of Copper and Aluminum foil and/or wire braid. The shield is then coated by something like PVC to insulate it from the environment. Now, not all coaxial cable is created equal and that is where the coaxial cable impedance comes into play. It is the coaxial cable’s physical characteristics that will determine its impedance. According to Wikipedia, “The characteristic impedance of the coaxial cable (in Ohms) is determined by the dielectric constant of the inner insulator and the radii of the inner and outer conductors.” The cutaway drawing above is helpful in visualizing these characteristics. With these details in mind, over time, the industry settled on two characteristic coaxial cable impedances for the vast majority of applications (>90%): 50 Ohm and 75 Ohm. First, let’s look at 50 Ohm Coaxial Cables. Experimentation in the early 20th century determined that the best POWER HANDLING capability could be achieved by using 30 Ohm Coaxial Cable, whereas the lowest signal ATTENUATION (LOSS) could be achieved by using 77 Ohm Coaxial Cable. However, there are few dielectric materials suitable for use in a coaxial cable to support 30 Ohm impedance. Thus, 50 Ohm Coaxial Cable was selected as the ideal compromise; offering high power handling AND low attenuation characteristics. With 50 Ohm Coaxial Cables being the best compromise solution, practically any application that demands high power handling capacity, i.e. 100 watts or more, will use 50 Ohm Coaxial Cable. A good rule of thumb is that any device that functions as a transmitter or transceiver tends to use 50 Ohm Coaxial Cable. This includes devices such as CB/Ham Radios, Broadcast Radio/TV Transmitters, Wi-Fi and Cellular Phone Repeaters and 2-Way Radios (Walkie Talkies). At Amphenol Cables on Demand (www.CablesOnDemand.com), we offer a plethora of 50 Ohm Coaxial Cable solutions. RG-58 Coaxial Cable is perhaps our most popular “gold standard” 50 Ohm Coaxial Cable product, because it provides acceptable performance for most applications at a very low price. Our next most popular is RG-174 Coaxial Cable. RG174 is great because it is so thin, i.e. 1/8th of an inch, allowing it to be used in real tight spaces such as feeding a GPS navigation antenna into a vehicle. For customers that want the absolute highest power handling capacity (1000 watts or greater), RG-213 Coaxial Cable is the way to go. RG213 is our thickest coaxial cable at nearly half an inch. For unique situations in which the cables must withstand extreme temperatures (i.e. up to 200 degrees Celcius), such as military and aerospace applications, we offer PTFE Teflon insulated coaxial cable products like RG-188 Coaxial Cables and RG-316 Coaxial Cables. These high-temperature coaxial cable offerings can handle extreme swings in temperature time and time again, such as those experienced when a plane takes off, ascends to 30,000 feet and then descends to land repeatedly. However, not every case warrants high power handling, so 50 Ohm Coaxial Cable is not appropriate for every application. When the objective is to ensure that the signal gets through the cable in the most efficient way possible, losing very little signal strength in the process, 75 Ohm Coaxial Cable is the way to go. A good rule of thumb is that if the device being connected via coaxial cable is a receiver of some kind, 75 Ohm Coax is ideal. This includes devices such as Satellite and Cable TV Receiver Boxes, High Definition Televisions, AM/FM Radio Receivers and Police Scanners. Another interesting application for 75 Ohm Coaxial Cable isCoaxial Digital Audio. This is the orange or black colored RCA jack commonly seen on HDTV’s, BluRay Disc Players and other Home Theater Gear. It is sometimes labeled as S/PDIF Out. It transfers the 5.1 Channel Dolby Digital Surround Sound signal to the home theater system for decoding and playback into the various speakers. Digital signals generally look like a square wave instead of the typical sine wave seen with analog signals like AC power or analog radio/TV. The so-called “enemy” of a square wave digital signal is capacitance (remember this one?). This is because increased capacitance tends to “store” the peaks of the square waves, skewing the shape of the square to look more like a straight line. When this happens, the receiver has trouble reconstructing the signal after it has traveled down the coax. Technically 93 Ohm Coaxial Cable has the lowest capacitance of any type, but 93 Ohm Coax is rare and expensive. Thus, 75 Ohm Coax is the closest fit, offering not only low signal attenuation (loss), but also relatively low capacitance. This combination of low attenuation and capacitance effectively make 75 Ohm Coaxial Cable the cable of choice for practically all types of digital audio, digital video and data signals. This is why every cable TV company uses 75 Ohm coax for distributing its digital video channels as well as its broadband internet data signals. Direct broadcast satellite dishes and over-the-air HDTV antennas also require 75 Ohm Coaxial Cable to ensure that all of the digital channels transfer down the cable with the lowest loss and distortion possible. While we do not offer the typical RG-6 Coaxial Cable with Type F Connectors used for cable and satellite TV applications, we do offer RG59 Coaxial Cables with BNC Connectors for other analog and digital video applications. We sell a lot of these cables to radio and television broadcasters and production companies to interlink their equipment. Older analog TV cameras and monitors in the studio will use RG-59 Coaxial Cables and newer digital TV cameras and monitors will use RG-59 as well for a high-quality digital video signal type known as the Serial Digital Interface (SDI). Finally, one last crucial point in regards to coaxial cables. The Impedance of the various devices being connected as well as the Coaxial Cable itself must match. So if you are, for instance, connecting a 75 Ohm video camera connection to a studio monitor, the coaxial cable must also be 75 Ohm AND the connectors on the coaxial cable (i.e. BNC connectors) must be 75 Ohm in Impedance. Every single time you have a mismatch in impedance, say between a 50 Ohm Coaxial Cable and a 75 Ohm Coaxial Connector (i.e. BNC), a standing wave develops. A standing wave is a signal reflection that is essentially wasted. Every time a 50 and 75 Ohm Impedance mismatch occurs, about 5% of the signal is lost. These losses add up and can eventually degrade the signal to the point that it is unrecoverable or distorted. Some coaxial cable manufacturers will cut corners in this regard. The BNC connector, pictured above, was invented by our parent company, Amphenol, before World War 2. It is extremely popular, but most people don’t realize that they come in two versions: 50 Ohm and 75 Ohm. All of our coaxial cables at Cables on Demand always have the proper impedance matched connectors to line up with the coaxial cable being used. One can view our entire selection of Coaxial Cable products at Cables on Demand by visiting our website (www.CablesOnDemand.com). I hope this blog post helped clarify any questions you may have regarding coaxial cable impedance and types. 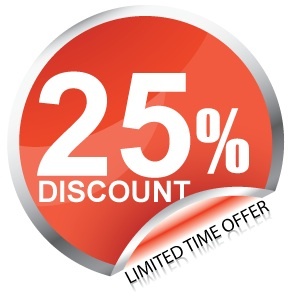 If you have any further questions, please don’t hesitate to contact us at: cablesondemandblog@gmail.com. This entry was posted in Uncategorized on March 6, 2014 by cablesondemand. Question: How Do I Know How Many Amps Your Cable(s) will Handle? Question: How can I tell what the maximum supported amperage capacity is for your cables? Thank you for the excellent question Rick! Understanding the voltage and current limits of your cable(s) is absolutely critical to maintaining a safe transfer of electrical power between your devices. All cables feature some degree of resistance to electrical energy. When electricity is forced to flow up against this resistance, it releases energy into the environment in the form of heat. When cables are very thin, i.e. 30 AWG or smaller, the cabling cannot dissipate that heat energy into the environment fast enough, leading to a fundamental breakdown (failure). The electrical breakdown of a cable assembly is not a pretty sight. During my younger years when my electronics expertise was in its infancy, I once made the horrible mistake of wiring a 12V DC switch incorrectly on a project box. The switch connected a 12V lawn mower battery to a radio transmitter. Upon engaging the mis-wired switch, the connection created a short circuit between the negative and positive terminals of the battery — effectively dumping up to 100 Amps of current down some 18 AWG wire. I watched in horror as the wire literally melted from the inside out, causing a flash-fire with the PVC wire insulation melting away like candle wax! The melted wire dripped onto the carpet and nearly started a house fire. Fortunately, I was able to disengage the switch quickly before things got even worse, but literally in a matter of seconds, significant damage was done. I learned a hard lesson that day about just how important current-handling capacity can be when it comes to cables. 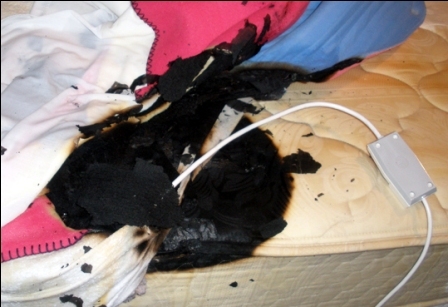 What would happen if a whole bundle of wires ignited and went unnoticed? Besides the fire risk, the burning PVC insulation contains toxic fumes that can prove deadly in their own right. To prevent disaster, you should always select a cable based on the most conservative of safety ratings in mind. The extra margin of error can be a life-saver. So what do you need to know first? 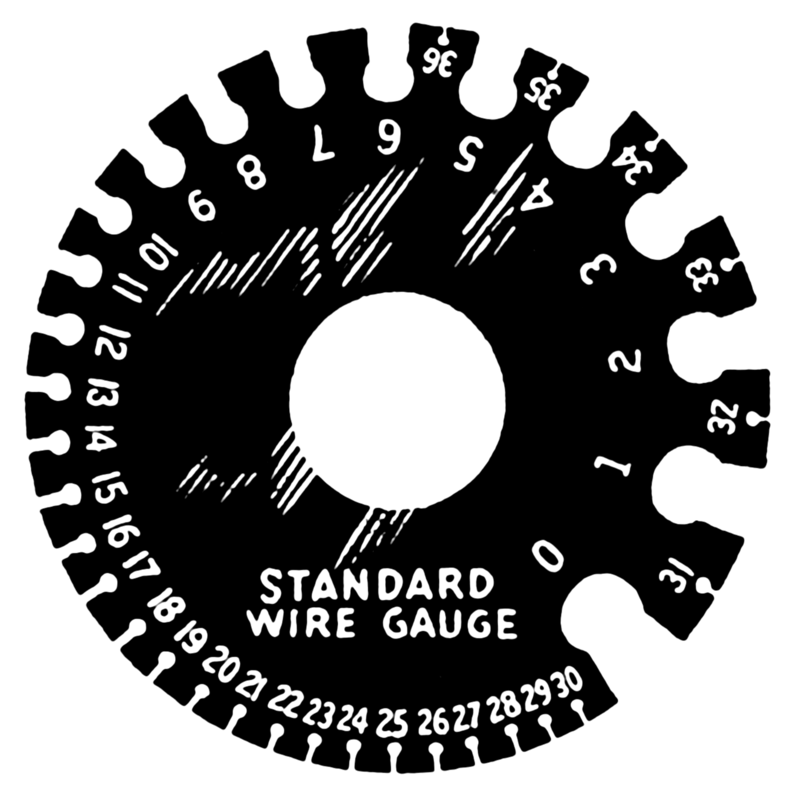 #1: You Must Know the Wire Gauge (AWG) of the Cable! This value is imperative. Our popular D-Sub Cables for instance tend to use 26 AWG insulated wire in their designs. They are often used in custom projects and fed with a variety of both power and signal data. #2: Is the Wire Bundled or out in the Open Air? This, believe it or not, makes a huge difference. When a wire is stand-alone and exposed to the open air, the movement of air around the cable will help cool it down, thus allowing for the transfer of more current. Chassis wiring refers to the wiring often found inside the chassis of an electronic device where you may have one wire in free-air that jumps from a connector on the outside of the chassis to a connector or PC board on the inside. Again, because it is in open air, it can handle more current for its given size. Power transmission wiring refers to any wiring that is bundled together. This is the figure you generally need to worry about most as most of the cable assemblies we make at Cables on Demand feature more than one wire bundled together. Note: This rule applies to all bundled cable types, even those you would normally associate with data transfer and not power. As an example, if you were to open up a typical outdoor rated power extension cord, it would have three wires bundled together (hot, neutral and ground). 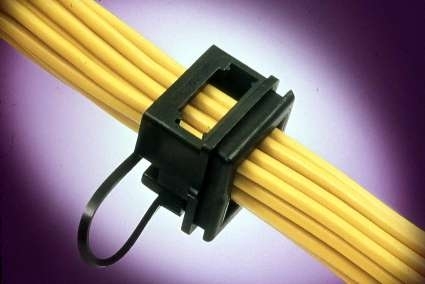 Since they are bundled and sealed off in a cable jacket, less current can flow through them safely. The chart below will tell you the maximum recommended current handling capacity (Amps) for a given wire gauge in both Chassis Wiring and Power Transmission Wiring versions. Remember to choose the Power Transmission Wiring value for most cables purchased through us and other cable vendors (bundled wire). Amphenol Cables on Demand (www.CablesOnDemand.com) sincerely hopes this information proves useful for you and your electronics endeavors! If you have any more questions, please call us toll-free at 1-866-223-2860 or send an e-mail to:support@cablesondemand.com. This entry was posted in Cable Amps (Current), Cables on Demand, Uncategorized and tagged ampacity, amps. amperage, AWG, current, power, wire gauge on January 30, 2014 by cablesondemand.